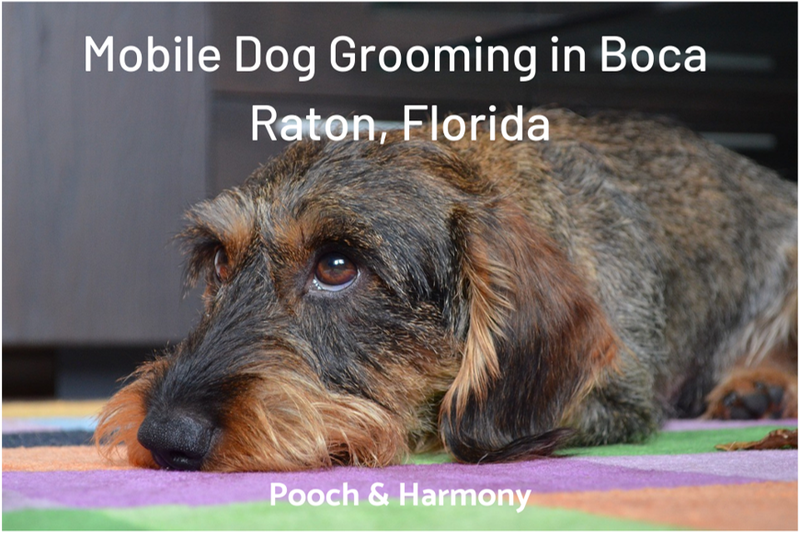 Are you looking for providers of mobile dog grooming in Boca Raton? Below you’ll find 3 top providers. Founded in Australia and now recognised worldwide with over 70 franchises, Aussie Pet Mobile is definitely a safe bet. Starting with the grooming vans themselves, they’re state-of-the-art, self-reliant units, designed to make grooming fast, easy and enjoyable for your dog. There’s heating, air-con and other amenities. Aussie Pet also uses biodegradable cosmetics and solar panels too, to keep it all as environmentally friendly as possible. You can schedule a groom for any day of the week, weekends included, and await the groomers at your home. Aussie Pet offers all of the standard grooming procedures in one, 15 (!) Step Luxurious Spa package, where all of your dog’s needs will be met with professional, friendly approach and care. Included is of course a bubbly bath, gentle brushing, a lovely blow-dry and even a treat at the end for maintaining best pooch behaviour! You can read all about the basic services included, as well as add-ons, here. Aussie Pet currently has an offer for new clients – call today to receive a free add-on service with your booking. You can also book an appointment online. Aussie Pet covers Boca Raton, Boynton Beach, Fort Lauderdale and others. You can find the full zip code and area list on the main website. The lovely Michelle of Beast and Beauty has spent the majority of her life and career working with pets – grooming both at salons and mobile vans, the industry has no secrets from her! If that’s not enough to convince you, she also holds unusual certificates (Fear Free and Low Stress Handling), which makes her a very appropriate choice if your dog suffers from behavioural issues or anxiety around strangers. Michelle truly cares about the well being of animals – her other business, PawTree, is all about premium, superfood nutrition for pets to nourish and energise them from within. As oppose to salon or mobile unit grooming, Michelle offers the third alternative for those not wanting to leave their comfy, familiar surroundings. House-call grooming is great if you like to know what’s happening with your dog at all times and don’t want to waste all day arranging drop off and pick up. For your furry friend it also means a much smoother, relaxing experience so it’s a win-win situation! To keep things simple, Michelle’s services include a Bubble Bath package ($55) or a Couture Cut ($70). The latter really has it all: from the sanitary trim, to a blueberry facial and massage, finishing things off with a new do and a nice little treat. Even the hairiest, most smelly beast will be an absolute canine beauty when Michelle has done her magic. You can call Michelle today at (954) 478-2212 and arrange your next session! Judging from the enthusiastic reviews, the certified groomer Yami from Apple Pet Grooming can definitely be trusted with pets and does an amazing job making them look like superstars in no time at all. As a mobile dog spa, Yami’s business is perfect if you like your privacy and want only the best care and personal attention for your pooch. The quality of service remains the same as what you can expect from a salon – if not better, as one-on-one contact is always guaranteed and there’s no stress caused by other groomers or pets coming through. When being groomed, your dog will not be kept in a cage, treated with chemical products or have any contact with other animals. Yami promises all of that to ensure everyone has the best experience and is feeling good, head-to-tail. The full service groom includes a bath with bubbly natural shampoo, ear cleaning, a fresh cut and teeth brushing. There’s more, obviously – you can read all about it here. Additionally, if you struggle with getting your home completely clean of dog hair, you can book your furry friend for a Furminator de-Shedding Treatment. You can finally say goodbye to your lint roller! Apple Pet operates in Palm Beach area and Broward County. You can book your appointment via email (info@applepetgrooming.com) or simply give Yami a call at +1 (561) 699. She is waiting to hear from you! Do you know of any other providers of mobile dog grooming in Boca Raton? Please tell us about them in the comments box below!